Discussion in 'Sager and Clevo' started by RaptorITA, Jul 31, 2018.
recently i'm having problems with the 860M on my Clevo W230SS. I bought it in 2014 and used it both for work and gaming; after buying it i imemdiatly installed the modded bios from Prema. solved reducing the GPU overclock or the CPU undervolt. One year ago i stopped using it as gaming PC due to personal life and time constraint; some weeks ago i found some spare time to start gaming again and i installed a new game, specifically Mass Effect Andromeda. For this game i used for the GPU +100 Core and +150 Memory overclock, and i was able to play for around two evening with a temperature around 85-90°C. On the third evening the game started showing artifact and crashing. Now i'm with a 860M which is not able to sustain any high load; for example it can run UNIGINE Valley Benchmark with low settings and 1280x768 resolution. The GPU driver crash under greater load, for example with the same low setting but 1920x1080 resolution. Also MSI Kombustor show artifact with high resolution/load and then the GPU driver crash immediately. I'm pretty sure that the problem is with the GPU, that is near death; everything else is working fine and the PC is usable with the integrated GPU or with the 860M under low load. I'm thinking about to replace the motherboard , if i find a very good deal, to fix the GPU problem. 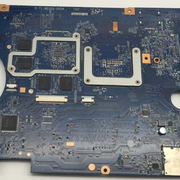 Some reseller don't have anymore a W230SS motherboard , but they do have a W230SD motherboard with the GTX 960M. 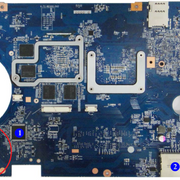 Is the W230SD motherboard 100% compatible with my current W230SS or i need to change somethings (cable, etc.)? I remember that in the past there was some problems for Prema to create a modded bios for the W230SD (similar to the one for the W230SS) able to unlock the full potential of the Nvidia GPU. Was Prema able to solve that problems and release a modded bios similar to the one for the W230SS? Since Prema site is not accessible anymore do someone have a copy of the latest modded bios for both the W230SS and the W230SD to share in PM (if @Prema agree)? Sounds like a dead GPU. 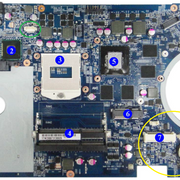 I can't remember off the top of my head but look at board and system pictures, are all the connectors and ports in a similar postion? As best I recall, most everything is in the same place. Best to take Meaker's advice and compare images with what you have before pulling the trigger on the replacement, though. Thanks for the tips, I will try to find online a pictures of the W230SD MB and compare it with my W230SS MB. Regarding the BIOS, any suggestions? Is there a way to dump the W230SS Prema BIOS and vBIOS out of my PC and install it on the new MB (if I find a W230SS MB at good price)? The BIOS/EC are are on two separate chips, you would need to use the original files you downloaded, did you keep them? I finally had today the time to perform the comparison suggested by @Meaker@Sager and @Prostar Computer and to dig inside the Service Manuals finding differences. I will report here what i found hoping that someone could find it useful. 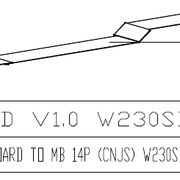 Here are the image of the MB for the W230 ST,SS and SD. For the ST and SD the image where taken from the service manual, while for the SS from internet; unfortunately the SS manual have images of the ST MB. 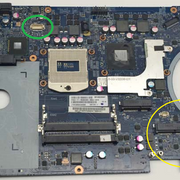 Backup Battery and Fan Connector: the ST/SS have a different position for both the battery backup and the Fan Connector with respect to the SD (yellow circles in the images above). 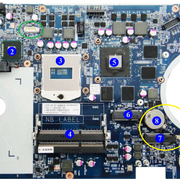 Since i want to install a SD motherboard inside a SS i think that the only thing that break compatibility is the new longer audio cable in the SD due to the new position of the audio connector. 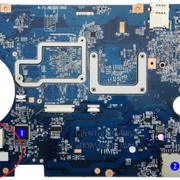 Does someone have an idea if the Audio Board need to be replaced as well? Did i miss something? We haven't played around with interchanging components from different generations on this model. This might come down to experimentation, if you can source the parts. 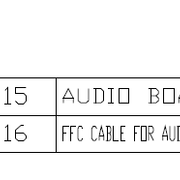 The audio boards use the same pin configuration, so that won't be an issue; you can recycle the one from the SS. Measure the pitch, minimum length and note the orientation of the exposed wires at the end (it's reversed or same-side). 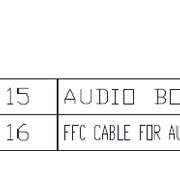 No need to buy an official part for this; you'd get the very same cable anyway, except at a premium. Always keep a bunch of old ribbon cables from gutted laptops; very useful for repairs or narrowing down the list of possible culprits. Prostar Computer and RaptorITA like this.